In this post, I am going to show you how to make a gratitude journal. Making a gratitude journal will also help keep your vibrations up. If you have been following me or reading any of my blog posts, then you know how much I am always talking about gratitude and how important gratitude is in keeping your vibrations up! Gratitude is probably one of the easiest ways for me to get my vibrations up because I am a very grateful person now that I am on this spiritual journey. Ever since I started learning about the Law of Attraction and creating my own reality, it has really humbled me. I am so grateful for life. And I appreciate life more now than I ever have! It has totally changed the way I am period. Instead of worrying, complaining and trying to get thru the day as fast as I can, I actually am taking time to enjoy life NOW! Once you start on your own spiritual awakening you will probably start to feel the same I am sure! What are some things that you can write in your gratitude journal? What can I make my gratitude journal out of? For this, you can use either a regular composition book of notebook paper, a journal or a planner! Or you can make yours however you want to make it.. You can make it on post-its, as long as you are writing them down! I have gone from a composition book (which is full now!) to my Law of Attraction planner! Practicing gratitude has never been easier for me now since I started using my LOA Planner! It actually has a place in the planner for you to write down what you are grateful for every day! I love that about the planner. You can see by the picture below what I started off with! It was a regular 5 section composition book. But it is completely full of my gratitudes. Every single page. Filled to the brim with my heartfelt gratitude and love for my life! I made gratitude a habit now. I write down and say what I am grateful for every single day! And this has helped me to manifest things, opportunities, and experiences into my life! But that is not why I am practicing gratitude. It has really changed my life for the better. I am a better person because of it! That is why I practice gratitude. This is what I use now. My Law of Attraction planner. 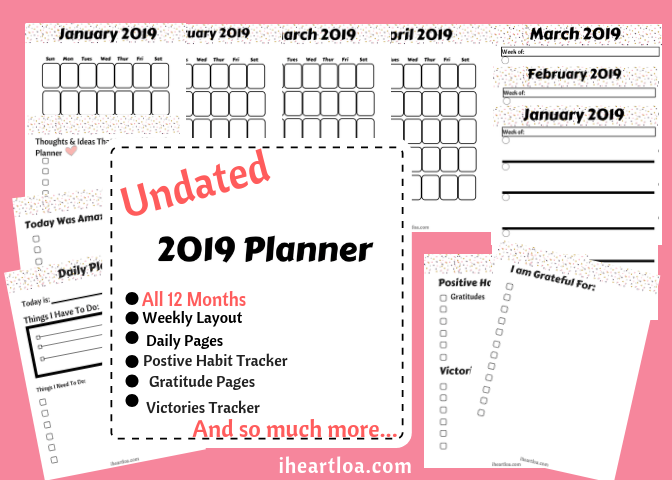 I have talked about this planner in another post that you can read here. But here is a pic of my planner! I have made you a planner printable that you can use to get started if you would like to. You can print it out as many times as you want to use in your journal or to make a notebook with! Just print it out and hole punch it. And you have a gratitude journal started! I will be making more printables like this. This was just something that I threw together pretty quick to help you get started. It asks you questions that you can ask yourself to get you thinking about what you are grateful for that day. I hope you like it and if you do use it, I would love to know about it! Here is a pic of it, but you can grab the real one at a special link I have made just for you. *Also, I just wanted to point out something real fast. That if you are ever having a bad day, feeling down or in the state of lack, I want you to go back thru your gratitude journal. Go back and read all the things that you are grateful for. Why? Because you will shift from feeling down or the feeling of lack to the feeling of abundance. Not what you don’t have!! When you focus on what you have, your belief system starts to change. It might take it a minute, but I promise you if you keep on practicing gratitude, YOU WILL SEE CHANGE! To read “my story” and how I am using gratitude to better my life & change my reality then click this link How Practicing Gratitude Can Change Your Life to learn more. It will open your eyes to what is possible. And I have some awesome resources connected to this post for you too. It has the first books that I ever read on LOA. These books have changed my life forever. I hope you have enjoyed this post! I am all about gratitude if you haven’t noticed. I would love to connect with you. Feel free to leave a comment. Do you practice gratitude? And if so, how has it changed your life?